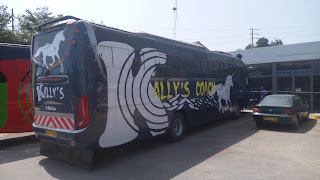 Over the past weeks i have several times come across the mysterious Kally's Coach. 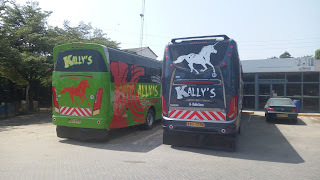 The Bus Company is mysterious because its not recognised in the list of Bus Companies in Kenya. So after doing a little research on the Buses, came to a conclusion of having solved the mystery. The Kally's Coach is a Bus Company owned by one of the owners of OiLibya, one among the largest petrol station company in Kenya. From my research, the Company has only two buses of plates KBS's series with Scania type of buses. The company is under a Mombasa - Lamu route Sacco famously known as Al-Wahim. The date of operations to the company is still a mystery that is yet to be unveiled. The route of operation will be Mombasa - Lamu route, increase the routes competition by different bus companies including Mombasa Raha which started its operations to Lamu last year. We wish all the best to the bus company hoping it will be among the list of bus Route Kings. Bus Kenya, We Will Always Take You There..